Beaterblog: In the Garage: 1991 Miata Runs! 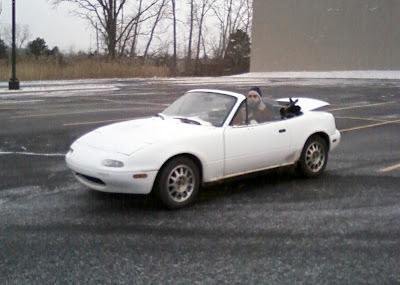 In the Garage: 1991 Miata Runs! 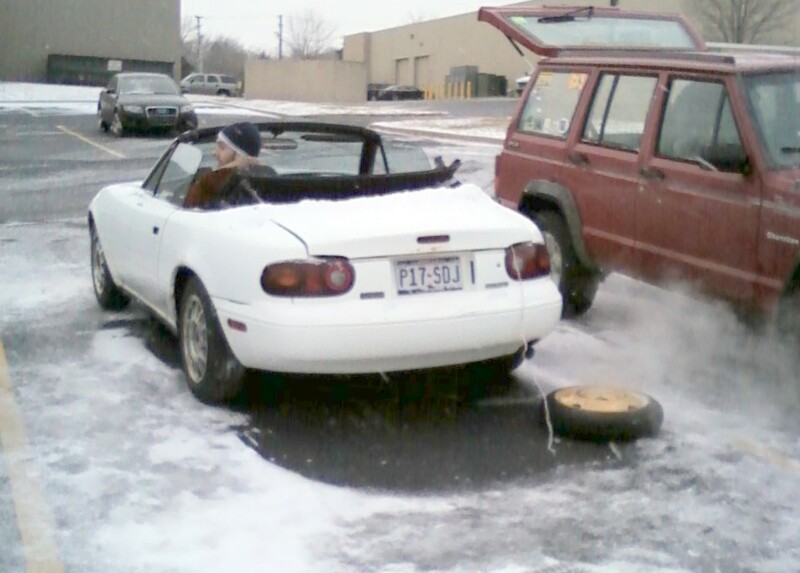 Project Miata was purchased as non-running and the seller's only clue as to the issue was "it might be fuel". Well it was fuel. Adding two gallons of regular unleaded and the battery out of the LeMons car got the roadster started. That's not to say it's without issues. The accessory belt immediately began to scream from being dragged across the locked up alternator. After cutting it off, I took a slow victory lap with the top down. Speed was kept to walking pace due to the complete lack of hydraulic or parking brakes. Considering it hasn't run in nearly two years, the motor didn't clatter or smoke other than a little white initial puff. Now that the Miata fits the Craigslist definition of "runs" its time to focus on getting the other projects out of the garage before the spring roadster driving season. Congrats! I was a little worried I had downplayed her issues, and you'd report that overly aggressive mice had chewed holes in the engine block. Thanks pete. Yeah, the turn signal didn't make the trip home but was otherwise uneventful. Mystery Car Update - Solved: LaDawri Castilian!